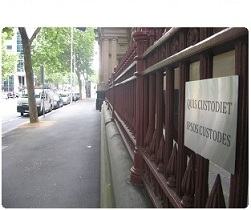 A couple of years ago the VLRC conducted a review of the system of bail in Victoria. Their Final Report was handed down on 10 October 2007. Prominent recommendations included a plain English rewrite of the Act and the removal of the reverse onus test, but overall there were 157 recommendations of the Commission. The current Bail Act is on borrowed time. Though it usually earns a chapter in every criminal law textbook, local resources that deal exclusively with bail are rare. Peter Faris QC has recently updated his commentary, which is only available online. He offers it for free over the internet rather than publishing it in hardcopy. Perhaps for three reasons. One, the cost of publishing is prohibitive and the financial return to the author so small as to not warrant the effort. Two, I was interested in the challenge to publish electronically and only electronically. Three, I can’t remember the third reason. As well as section-by-section discussion of the Bail Act 1977, Faris provides hyperlinks to his sources. While I don't agree with everything he's written, that's partly the joy of reading it.